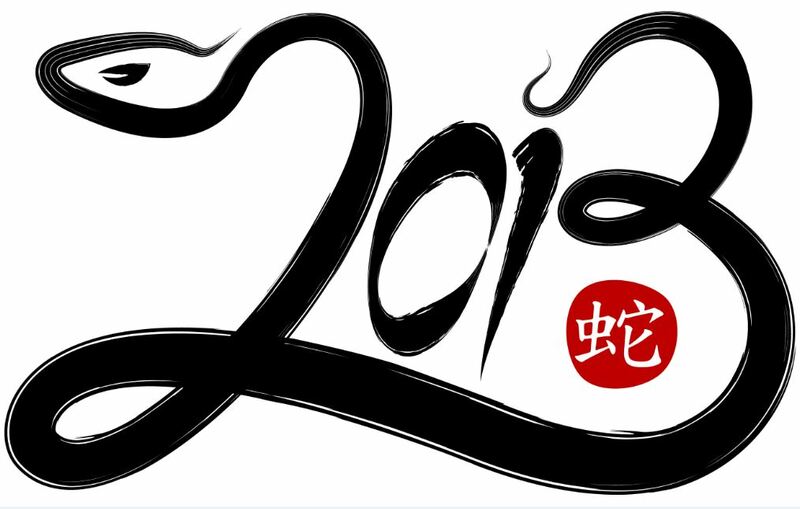 Last Sunday was New Year’s Day according to the Chinese calendar. Millions of Chinese enjoyed extravagant celebrations and extended vacations. So far, both the Chinese economy and equity markets have had a great start, making the national holiday even more enjoyable. It seems like a great time to give an update regarding our outlook on China. 2011 and the first half of 2012 were hard times to hold emerging market equities, due to their underperformance relative to U.S. domestic equities. However, during the second half of 2012 emerging market equities rebounded from their lows and outperformed U.S. equities. We believe that there are still great opportunities in the emerging markets, and this short commentary focuses on China, home of the largest emerging economy. Fears of China’s hard landing have haunted investors for the past two years. The global growth slowdown and high domestic inflation undoubtedly fueled concern for the future of China’s economic growth, but China managed to rebound. The leading indicators rebounded in the middle of 2012 while the GDP growth bottomed in the third quarter of 2012. Electricity production, a well-known indicator of economic activity, also rebounded during the last quarter of 2012 and is approaching its all-time high. China’s official growth target for 2013 is 7.5 percent, unchanged from the 2012 target, as Beijing will try to stabilize growth instead of refueling inflation and the growing income imbalance. A Bloomberg survey based on 47 institutions shows that the average GDP growth forecast for 2013 is 8.1 percent. Although there is always a chance of unexpected economic or financial shock, my opinion is that China’s growth will continue to rebound in the intermediate term. Two major themes discussed below will help fuel the future economic growth this decade. Chinese officials announced that urbanization will be the key to China’s future economic growth. This strategic plan is easily supported by the demographic data shown above. The 32 percent gap between China and other more developed Asian countries gives room for China to further expand its urban population and city size. The expansion of cities will nurture infrastructure spending in areas such as private housing, hospitals, schools, and utility related projects. The coming development will help absorb the extra industrial capacity built during the past years and to support domestic consumption growth. Scholars have talked about the imbalance of China’s growth for a long time. It is unsustainable for China’s economy to keep growing rapidly by continuously increasing capital investment while suppressing consumer spending. The gap between capital spending and household consumption has widened since 1999. The Chinese central government realizes this issue will impede sustainable growth in the future. It is policy makers’ consensus that the future growth will be mainly driven by expanding domestic demand. Urbanization will help this plan as larger cities provide more opportunities for both employment and consumption. In addition, the government will boost consumption by both increasing income and subsidizing consumption. The government has approved a plan to raise the minimum wage to 40 percent of average urban salaries by 2015. The social housing or affordable housing program, which targets 36 million units of new housing by 2015, will help to unleash the wallet of low-income consumers. Chinese banks started to aggressively market credit cards and to build a credit system a few years ago. The development of a consumer finance sector is now part of the nation’s strategic financial reform and long-term economic growth plan. It is interesting to see how financial leverage will help fuel the spending power of Chinese consumers. If the rebound of consumption continues, the weight of consumption in China’s GDP will rise sharply in the future. Even if China’s overall GDP growth slows over time, the growth of China’s consumer and infrastructure sectors will be leveraged by a higher share of GDP boost. Patient investors who can bear the risk and hold these positions in the long-run could earn a decent return. 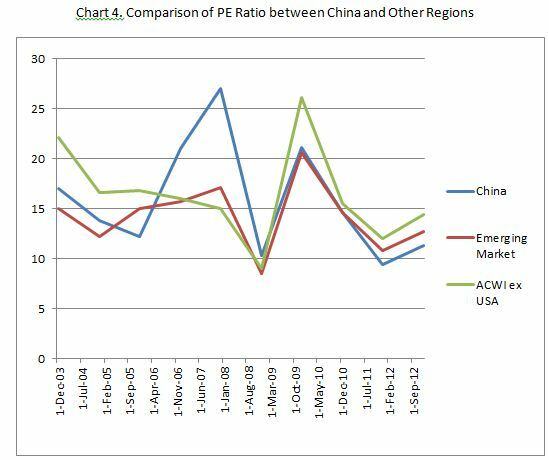 The PE Ratio of Chinese equities rebounded from 10-year low at the end of 2012. Compared to its history and other major indices, Chinese equities are still attractive. If the growth recovery continues and the economy rebalances as expected, investors’ concerns will fade and the PE multiple will expand accordingly. According to my analysis, investors could benefit from both earnings growth, and PE multiple expansion. The views expressed herein are exclusively those of CLS Investments, LLC, and are not meant as investment advice and are subject to change. Information contained herein is derived from sources we believe to be reliable, however, we do not represent that this information is complete or accurate and it should not be relied upon as such. All opinions expressed herein are subject to change without notice. This information is prepared for general information only. It does not have regard to the specific investment objectives, financial situation and the particular needs of any specific person who may receive this report. You should seek financial advice regarding the appropriateness of investing in any security or investment strategy discussed or recom­mended in this report and should understand that statements regarding fu­ture prospects may not be realized. You should note that security values may fluctuate and that each security’s price or value may rise or fall. Accordingly, investors may receive back less than originally invested. Past performance is not a guide to future performance.